Stabila Type 96M Magnetic Levels. Available sizes - 16", 24", 32", 36", 48", 59", 72", 78" & 96". Stabila Heavy Duty Type 196 Levels available in sizes 16", 24", 36", 48", 72", and 96"
STABILA levels are unparalleled with regard to their accuracy and dependability. Stabila General Construction Type 80A-2 Levels available in sizes 24", 48", and 72". Stabila Type 196 Level w/Hand Holes. Set includes a 16" Level and 48" Level. Special offer good through 4/30. The LA 90L multi-line laser allows you to layout greater than 20ft up to 300ft fast and accurately. Another world's first! The revolutionary MOTION CONTROL remote makes every measuring task easier, quicker and more effective. The LD 220 is a professional entry level tool for the most frequently needed measuring tasks, giving you accurate results and ultimately saving time and effort. Extremely versatile – the TECH 700 DA digital electronic angle finder. 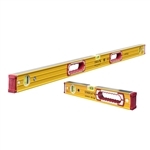 A high-quality product made in Germany that perfectly combines three tools: angle finder, spirit level and bevel gauge. STABILA has engineered a new extendable level, The 80T. It allows its size to be extended to fit the job. STABILA Type 196 Levels are ideal for bricklaying and carpentry, in wood construction, reinforced concrete construction, window fitting, road construction and landscaping work. Jamber Set includes 32" & 78" level. The newest level from Stabilla! The Stabila LD-520 Laser Measure is a full feature laser measure packed with features and functions. Stabila REC 210 Receiver makes measuring simple for non-rotating "pulse line" lasers. LaserBob Cross Line and Plumb Point Layout Tool 03180. Self-leveling with bright, crisp laser lines and plumb dots. Rugged design with transport lock. 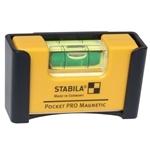 Stabila Magnetic Pocket Level snaps to pipes or any metallic surface. Comes with pocket holster and clip for easy storage and access. The Stabila LAX 400 Pro Liner Multi-Line Self Leveling Laser offers 360 Horizontal line, two vertical lines at 90 degrees to each other and plumb points with bright, crisp lines and dot. Works with or without receiver. LaserBob 5 Beam Layout Tool 03160. Self-leveling with five bright dots for laying out right angles, measuring plumb and transferring measurements from floor to ceiling. The STABILA LAPR-150 rotation laser is an easy to operate rotation laser for horizontal and vertical leveling and plumb lines. It is self-leveling in a range of ± 1°. The Stabila LAR-250 rotation laser is an easy to operate rotation laser for horizontal and vertical leveling and plumb lines. Stabila REC 150 Receiver makes measuring simple for non-rotating "pulse line" lasers. All new from Stabila! The Stabila LAX300G features green vertical and horizontal lines plus plumb points that are up to 5X brighter than red beams. Crystal clear vials readable in any direction with no change in accuracy tolerance. Simple. Better. Visible. The cost-efficient all around laser with bright green laser lines. We are celebrating 130 years of STABILA with our limited-edition and exclusive 1889 Edition. Limited production quantity of this special four piece 1889 Edition set establishes the bar for quality and value in the spirit level category. Sale price good through 4/30.